Some people who have heard the term “nuclear electromagnetic pulse (nuclear EMP)” have not taken it seriously. They have associated it with callers to George Noory’s late night radio show “Coast to Coast AM” distributed by Premier Networks. Those who have not taken this very real threat seriously have made a grave mistake. 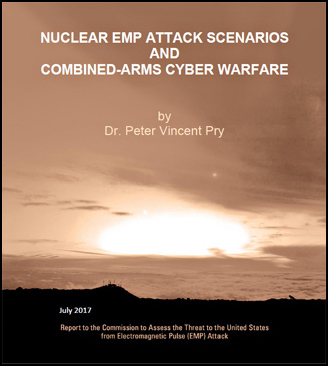 This statement is taken from a recently declassified 2017 report entitled Nuclear EMP Attack Scenarios and Combined-Arms Cyber Warfare. The report was prepared for a Congressional commission, the Commission to Assess the Threat to the United States from Electromagnetic Pulse (EMP) Attack. Though the report’s opening statement quoted above suggests EMP would be used only by nation states against us, it is clear from material later in the report that “blackout warfare” is within reach of criminal cartels and terrorist organizations (see report, page 10, “The Gathering Storm”). If you’re unfamiliar with the principles of nuclear EMP, I suggest you start reading with chapter 2 at page 12, “II – EMP Attack: Basic Facts and Principles. In the simplest possible terms, a nuclear EMP would render completely inoperable all or nearly all electrical equipment in the EMP’s zone. The size of that zone would be determined by the altitude of the detonation.